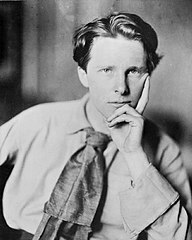 Rupert Brooke was born August 2, 1887 to William, a schoolmaster, and Ruth Brooke in Rugby, Warwickshire. Brooke's writing of renaissance theater won him a scholarship to King's College, Cambridge where he was a member of the Cambridge Apostles  , an intellectual society, and was president of the Cambridge University Fabian Society  , a liberal political voice within the university. At Cambridge, Brooke befriended a number of future Bloomsbury  members, a group of intellectuals working around Bloomsbury, London. Brooke's poems in the navy often have an idealistic depiction of war, like The Dead  and The Soldier  . In The Soldier, Brooke glorifies his potential death for his country. That his body, and the land it becomes, belongs to England and makes 'rich earth' 'richer' due to his experienced English air, water, and sun. Though, it's interesting to think of the line as "blest by sons of home," as Brooke had lots of admiration from friends, colleagues, and superiors. He goes on to say his heart has no evil since England gave him positive thoughts, and he returned positive thoughts. That England would continue to be a peaceful, gentle heaven of pleasant sights, sounds, and people. All this, to describe death during wartime. Brooke speaks of laughter, flowers, gentleness, and the sun in relation to death and war, in a what would be titled The Soldier. The Soldier shows some very Victorian themes, like the romantic ideals of war and enthusiastic patriotism. Ideas that would clash with gruesome horrors of the Great War and following pessimism for the future. Though, for as unrealistic a depiction of death in war Brooke describes, his own death would seem to be as peaceful and ideal as what he wrote in his poem. If I should die, think only this of me: That there’s some corner of a foreign field That is for ever England. There shall be In that rich earth a richer dust concealed; A dust whom England bore, shaped, made aware, Gave, once, her flowers to love, her ways to roam; A body of England’s, breathing English air, Washed by the rivers, blest by suns of home. And think, this heart, all evil shed away, A pulse in the eternal mind, no less Gives somewhere back the thoughts by England given; Her sights and sounds; dreams happy as her day; And laughter, learnt of friends; and gentleness, In hearts at peace, under an English heaven. Browne would be killed in action on June 4, 1915 during the Gallipoli Campaign.